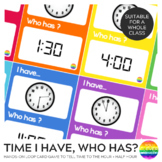 32 "I have, Who has" game cards on elapsed time. Covers elapsed time by the hour, 45 minutes, 30 minutes, and 15 minutes. 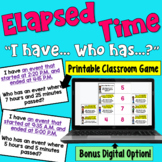 Check out my Elapsed Time Task Cards for another elapsed time activity! Once Upon a Time I spied tiny little CVC words! Time - I have...Who has? 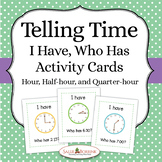 Telling Time "I Have Who Has"
I Have, Who Has Game - Time to the Five Minutes Give each student one card. The student with the starter card (the card with the yellow star) begins by reading their card: “I have ____. 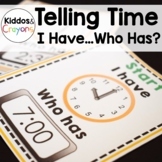 Who has ____?” The game continues until it gets back to the student with the starter card. A Wrinkle in Time "I Have, Who Has"
Use this game as a test review once you've finished the novel. 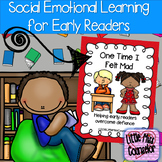 Cards include vocabulary words, characters, settings, and plot events.